Has it ever happened that you bragged about never running into a certain kind of problem and that soon thereafter you found the problem waiting for you with arms wide open? Happens to me all the time. My memory fails me when I try recalling all the occasions this has been the case due simply to this jinx never failing to embarrass me. I had one of these episodes not so long ago. So, the memory of it is still fresh. And it is impossible I’ll ever forget the incident because of how exceptional it was. I am not a frequent flier, which essentially means that I experience fewer air travel woes than those who fly a lot. My brother is no frequent flier either, but he flies more often than I do and invariably experiences some trouble or the other. On my family holiday to the south of the country this past November, I had the joy of finding myself on a flight to Mumbai that not only took off before time but even landed before time. Such a pleasant break from flight delays that have become so much the norm! Early arrival meant we didn’t have to go into a mad rush to catch our connecting flight to Chennai. As soon as we reached the boarding area for the next flight, I messaged my brother, bragging about the early departure-early arrival thing. The next thing I know is that the next flight is delayed! “Chalo, that’s normal,” I thought. Then, we learnt there was going to be some more delay and then some more. There was nothing we could do except wait. Wait we did. Patiently. Very, very patiently. But the boarding gate would just not open. By the time it finally did, we had had a delay of well over an hour. Though this delay did not upset our plans for the very little of the rest of the day that was left, it did leave us worried because we had to do an hour and a half of taxi journey to Mahabalipuram and the weather was rough. This last line was as if I had a premonition, except that I didn’t. The flight landed 10 minutes before time at the Chandigarh Airport. 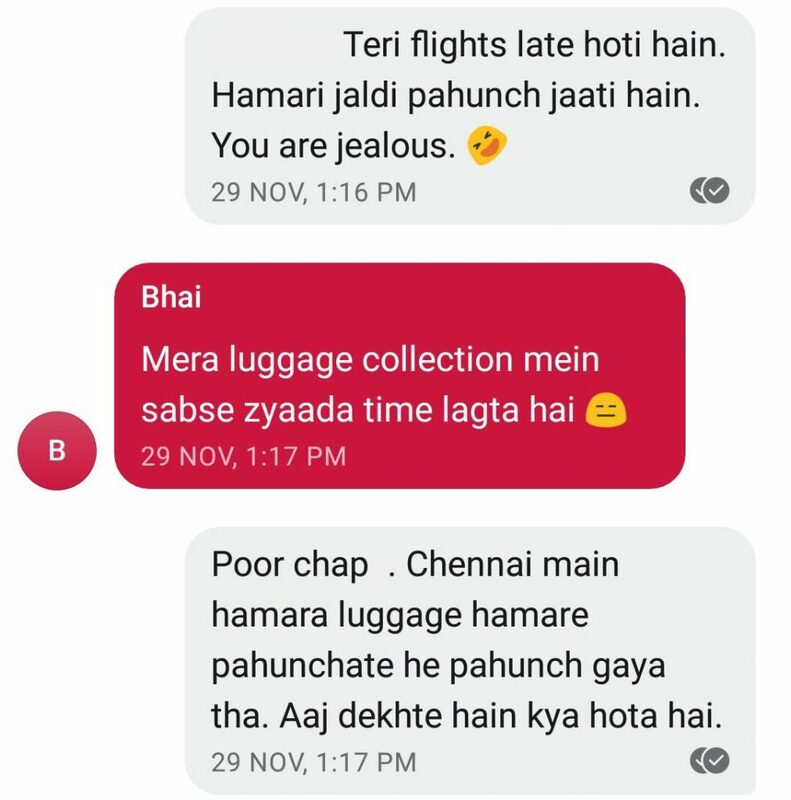 As Papa and I walked towards the Baggage Claim area (Ma had stayed back with Bhai, so there were only the two of us), Papa decided to use the restroom and convinced me to do so too. What harm could going to the loo do anyone, right? Wrong! When we reached the designated belt to get our bags, the place was already chock-full of fellow passengers. We were forced to go to the other end, opposite to where luggage is pushed on to the belt. Person after person picked up their bags and exited. A group of middle-aged folks on my left were excitedly talking about going to Shimla. Quite a boisterous bunch it was. Soon, the whole area wore a deserted look. A bag or two kept circling around, waiting for its owner to stake a claim. Papa’s red duffel bag had already arrived; my black suitcase had not. Now, this was not normal. I looked around, worried. I have had luggage problems in the distant past, all of which were resolved later if not sooner. So, I kept my cool. But something had to be done, obviously. I spotted an Indigo staffer and approached her to describe my problem. She had two other passengers making luggage-related enquiries of a nature completely different from mine. Her attention was, quite naturally, divided. To make matters worse, she was the slowest talker I had seen in a long, long time. She had no sense of urgency and was slow to react and respond – the jaldi-hai-kya-umar-hai-padi types. By the time I managed to get her undivided attention, we had been waiting for my luggage for more than an hour. Mishandling, delay, damage, and loss on the part of the airlines are common. I almost knew Indigo had messed it up. But I also had the hunch that my bag might have been taken away by another passenger. Not that I personally knew anyone who had had such misfortune. It’s just that during the idle moments spent waiting for my luggage on previous journeys, I had often wondered: What if…? It was that same question popping up in my mind; only much more intensely this time. While I made enquiries with the airline staffer, Papa went around doing his own investigation. One security person he spoke with told Papa that he was previously posted in the Mumbai airport and that there were 2 or 3 cases of luggage mix-up every day. When Papa came back with this scoop, my suspicion grew stronger. My slow-talking interlocutor, meanwhile, had made some calls trying to track down my suitcase. Since Lady Luck had very clearly walked out on me (as she often does), my bag was found to have encountered no hurdle and to have arrived in Chandigarh on the same plane as I. 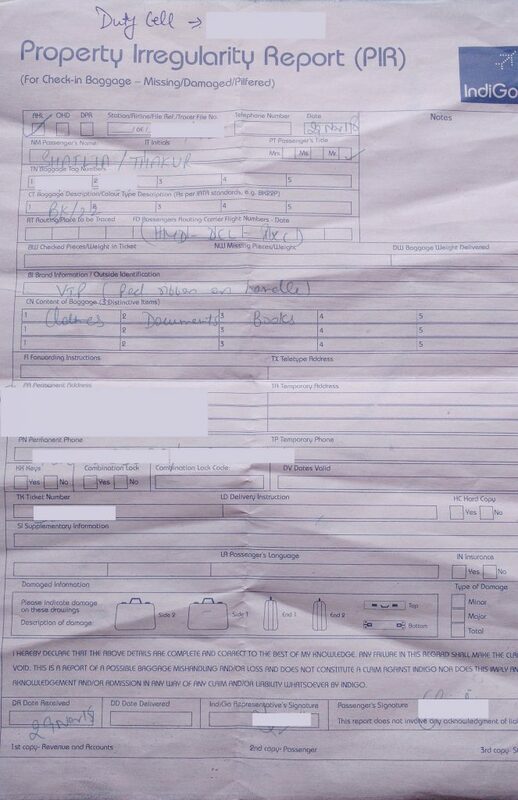 The Property Irregularity Report the Indigo staffer had me fill out while trying to trace the trajectory of my suitcase. Airlines use the PIR to trace missing, delayed or damaged baggage. Either the airline was lying or my hunch was right. But how would I know? I asked Ms. Jaldi-hai-kya if it was possible someone had made away with my luggage. She said it was totally possible. To my disbelief, she added there had been cases of passengers walking away with bags of other passengers who had arrived on a different flight of a different airline. “Wow,” I thought, “just the scare I needed!” Just then, she pulled a lone bag off the carousel and told me it was from my flight. One bag missing, another one unclaimed. Both from the same flight. Now we’re talking! The possibility of my bag having been taken away by the owner of this one looked quite high; though the bags were not comparable. Sure, they were both black. But mine was 1.5x bigger and 1.5x heavier if not more. Mine also had a red ribbon on the handle for identification, and the handle was broken on one side. Not to mention that it was a VIP and this one something else. How could someone be so silly to walk away with a bag that was so dissimilar to theirs? 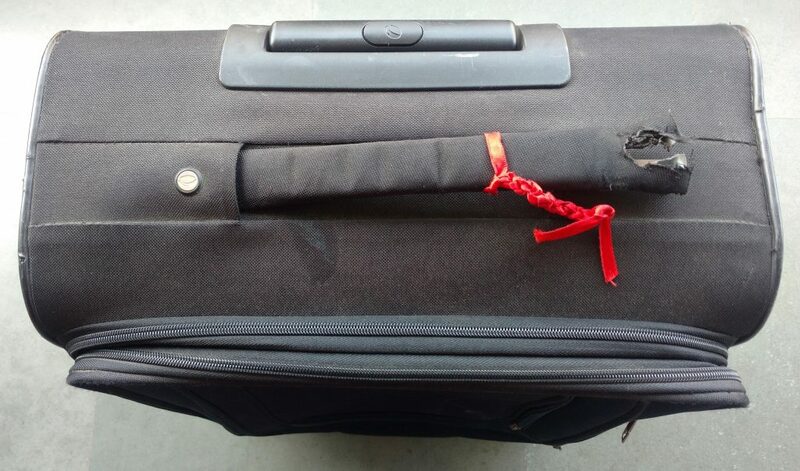 Neither the red ribbon around the handle nor the brokenness of the handle could save me from luggage mix-up. Our challenge now was to track down the owner of this orphan. Ms. Indigo made some calls and discovered it belonged to someone from Delhi, travelling in a group of 25. Some headway; yay! Another call revealed these Dilliwalas were on their way to Shimla. Thank goodness, they weren’t going to Manali or some place in Punjab! But was my bag with them? Yes, it was! But where were they right now? It had been an hour and a half since our ordeal began. They couldn’t have gone too far. But just how far had they gone? Anyone going to Shimla passes by where I live. It turned out they were a mere 5 kilometres away from there! Now all we had to do was catch up with them. We asked them to wait. 45 minutes was all we needed. But they didn’t want to wait! The person I had been speaking to was the leader of the group, and he was in no mood to wait. All this while, I had been very calm, unusually calm. But this brazen callousness got to me. I reminded him I was in a mess because one of his own had been utterly careless. I also made it clear I wanted my suitcase back that same day. No sight-seeing was possible for them because they weren’t going to reach Shimla before 8. Their desperation to move on amazed me. Fortunately, their next plan was to stop a couple of kilometres away at a hotel for a meal. Although this meant us having to do a longer distance to get where they were, it did give us the opportunity to make up for the lost time. The suitcase’s built-in lock clearly says VIP. Like the other indicators, this one too failed to prevent the mess. Ironically, the tiny brass lock (useless anyway) facilitated it. As Shriman Murphy said, when something has to go wrong, it will go wrong. Earlier in the day, we had planned to stop at a restaurant en route to have lunch – the last outside meal of the trip. That plan had to be abandoned of course. While we were driving anxiously to bring the goings-on to an end, the saanu-ki-Dilliwalas were gorging on good food, their forsaken bag undertaking the journey to be reunited with them with an unwilling stranger. Eventually, when I got to swap the bags, the man responsible for the absurdity smiled sheepishly and explained the bag was his wife’s and that he had looked for the brass padlock, which both their bag and mine had, and decided that that was the bag. The red ribbon, the broken handle, the size, the weight, nothing mattered. The only thing that mattered was that small piece of metal which all of us in India seal our bags with! He apologized for the goof-up, and I let go. My holiday had been a very enjoyable one. I didn’t want to sully the memories of it with a confrontation. Besides, it was unintentional. I ran into the group leader too, who obnoxiously told me it was all destiny. This man I would have loved to punch! Know who these people were? The same noisy-chatty bunch who were standing right next to me at the carousel. If only I knew. Tip No. 1: Do NOT buy a black bag. Go for pink, orange, yellow, purple, sky blue, whatever. Anything but black. Almost 90% bags are black. You don’t want to go through what I did because some people are too careless, do you? Tip No. 2: If you already have a black bag, use eye-catching identifiers and use more than a few. Bright ribbons, tapes, stickers, belts, paint… Be imaginative. Go kitsch if you think it will save your life. I had a red ribbon tied around my bag’s handle. In retrospect, it wasn’t big enough to be noticeable. Also, red ribbons on bags are fairly common. Tip No. 3: Stand as close as possible to the place where the luggage is pushed on to the carousel. I have always hated how people crowd around that area. From now on, I am going to be one of those people. Tip No. 4: Go straight to the Baggage Claim area after deboarding. Do NOT stop for snacks. Do NOT stop to relieve yourself. Sorry, dear bladder, you gotta cooperate. Tip No. 5: Be responsible for your own luggage. Do NOT delegate the task of fetching your bag/s to a relative, friend, or whoever you are travelling with. You don’t want to be the person who creates a luggage mess, right? Tip No. 6: If you have kids with you, keep them away from the carousel. Not only can they hurt themselves, but they can also mix up stuff. I have seen too many hyperactive kids pulling off bags from the belt. While kids can be more attentive than adults, you want the situation to be under your control. Tip No. 7: Check your luggage before you leave the airport. Count the pieces. Look for all the things that make your bag your bag. You may be in a hurry to leave, but this step is important. Tip No. 8: This is the last tip and also the most important. Never ever ever ever brag about anything in life. Bragging is impolite if it ain’t an open invitation to troubles you thought you didn’t have.